Elbe tour boats and port barges, speed boats and container ships: in the Port of Hamburg, there is a full range of working and pleasure vessels. But how is this daily level of seagoing, inland, traditional and pleasure vessels coordinated? The smooth movement of traffic on the waterways in the port area is only possible if nautical safety is continuously ensured. Maintaining this safety is the task of the harbour master's division. 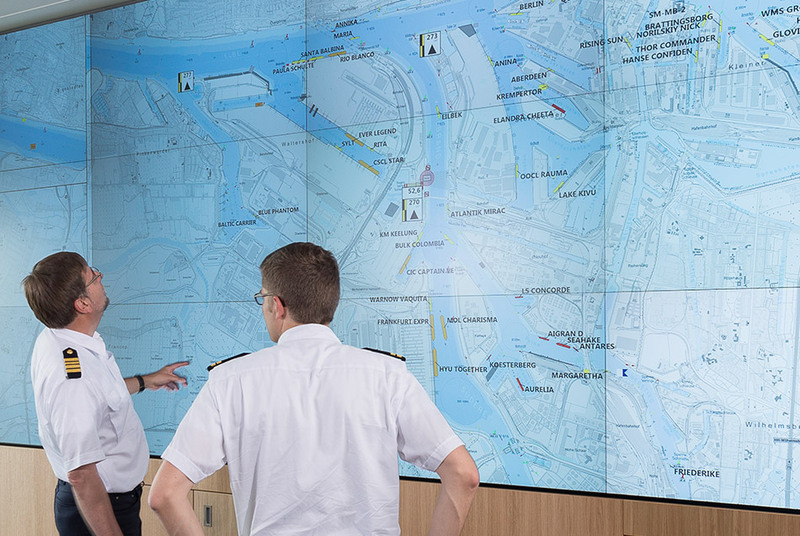 We keep you informed about navigation routes and berths and advise vessel navigators from our nautical control centre. Well cared for, well prepared: Firstly, the harbour master's division safeguards the constant safety of shipping through the use of navigation management measures, and where possible further improves these. Moreover, the harbour master's division considers the preventive exercise of functions as its central task. This includes the early identification of disruptions in the maritime traffic and the implementation of appropriate measures. These preventive measures not only increase safety, rather they make an essential contribution to the productivity of the Port of Hamburg. 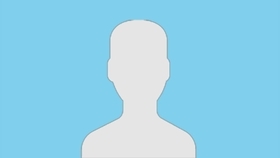 All contacts from the field marine infrastrucutres are listed and pre-filtered for you. Here you can find all downloads from the section marine infrastructure prefiltered for you. Didn´t find the right download? You will find every download in the HPA Download-Center. Ships that enter the port of Hamburg, operate there, or use its facilities and/or services are generally subject to mandatory reporting. Port fees and charges must be paid for contractual services used. The basis for the reporting obligations is the Verkehrsstatistikgesetz (VerkStatG i.e. the Traffic Statistics Act), the Port Traffic Ordinance, as well as the general terms and conditions of HPA Hamburg Port Authority AöR for private legal agreements regarding the general use of the port of Hamburg (General Terms and Conditions), including the Price List for port fees in their respective valid version. If you have any questions regarding transport, handling, storage, logistics, etc., please contact the freight forwarders, terminals, or relevant service provider directly. An overview is available via the PORTlog web portal, which includes links to the respective service providers. submit a declaration of port fees to the HPA port fee office, preferably in a electronic way through the webportal MUST-HAVE or in the form of a blank. submit a registration, cancellation or interim report to the HPA remuneration office for inland and port shipping, preferably in an electronic way as PDF through e-mail or by post. which mainly run within the Port of Hamburg throughout the year establish contact by telephone with the remuneration office for inland and port shipping. We ensure the smooth flow of traffic on the water. We use the most modern IT-based control systems to direct ship traffic in the port around the clock. We take care of the big boys personally: HPA assumes the radar and pilot transfer services from the land to the ship and back. This allows us to play it safe – even when activity is at its peak on the water. Safeguarding the waterways and shore areas also falls within our scope of activities, as does the operation and maintenance of locks, sea signs and radar stations in the port area. 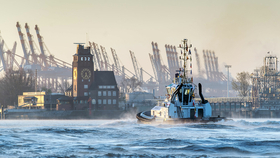 Even if the weather changes, we are on it: effective preventative and early-warning measures allow HPA to secure the port of Hamburg in the event of floods or storm surges. But HPA’s measures are not only required in the event of severe weather. Our ice breakers also provide flood defence in the event of persistent negative temperatures. Safe and unencumbered transport at all times is the highest priority at the port of Hamburg. 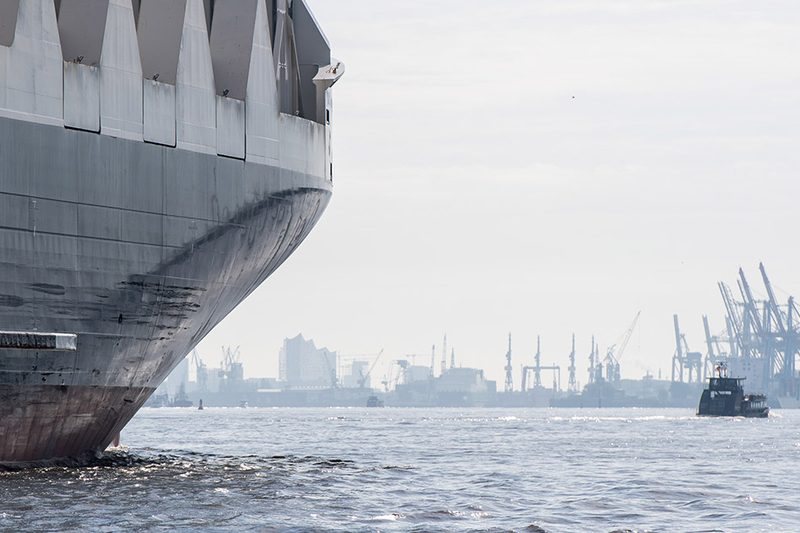 Whether big or small, we guarantee every ship free passage through the port of Hamburg. Thus, we measure the depth of the water regularly. Because the River Elbe – like all watercourses – is constantly moving, depositing slit and sediments. In addition, the water level rises and falls with the tide. Our measuring engineers are on the water in a fleet of four depth-sounding vessels. And when it becomes necessary for safety reasons, dredgers come into play. They dredge the bed of the Elbe so the big boys can sail through unimpeded. A total of 150 kilometres of embankments and a few kilometres of beaches must be regularly maintained to keep the waterways in the port area in good shape. This includes reinforcing the embankments using plants, stones or paving, as well as sand disposal, which is used to artificially extend the Elbe beaches, for instance. Not only does the latter secure the banks, it also appeals to residents and visitors alike. They appreciate our cleaning skills even more: every year we remove more than 300 tonnes of garbage from the Elbe beach – without complaining. In order to make the waterways even more safe and effective, and to meet the growing volume of traffic, we are continually examining the expansion of waterways and moorings. We are also working on continuously developing our control systems as well as the interactive traffic management of the waterways to improve safety and better coordinate ships. The port is growing. We are a part of that. Whether it's berths or reporting requirements. There are laws for maritime shipping, too. 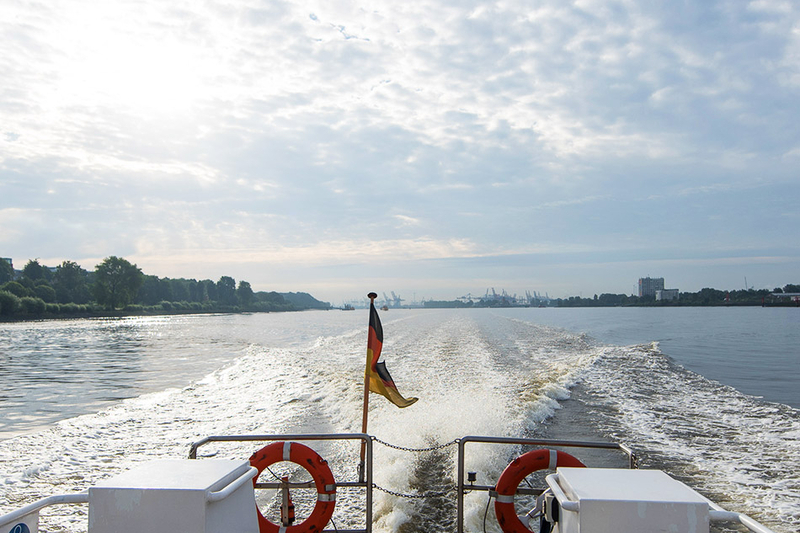 We gathered relevant information for you to make sure you can navigate safely towards the Port of Hamburg. Launches, ferries and supply ships are daily under way in the port. You can find information concerning berths, transport of persons for remuneration, authorization and patent for the port here. Inform yourself about berths, reporting requirements, registration or cancellation, shore side power or drinking-water supply and much more. We offer lots of space for leisure and history. Learn everything about the motorboat and museum port, events and rules here. You need vehicles and tools, with or without staff? Being a full service provider we provide a stock of about 50 ships for our customers. A minimum horizontal lateral distance of 50 metres from vessels (stationary or moving – 250m from military watercraft) must be maintained. The course of vessels may not be crossed at a horizontal distance of less than 200 metres (300m from military watercraft). Vessels must be given priority in every case; in particular, docking and undocking vessels must not be hindered. Vessels may only be overflown at a vertical distance of at least 50m, provided the maximum authorised altitude permits this. Deviation from these distances is permitted in the event the vessels are stationary, if their owners have expressly permitted this in writing. The take-off and landing of drones from and on moving ships or navigating vessels is not permitted for safety reasons. HPA at DrehundFilmanfragen@hpa.hamburg.de as required. Such approval shall be without prejudice to the rights of third parties as well as other existing prohibitions and licensing/approval requirements that are outside HPA’s scope of responsibility. Data protection provisions shall remain unaffected. A total of 133 bridges link the Island on the River Elbe. We are responsible for their conversion and new construction. In order to have a free journey, you will find all opening and operating times as well as contact details for the registration. We are landlords and architects. Take a look at our references and exposés which will build your trust in the port as your location. Follow us to the port on the road to success with our future-oriented PORTroad management. Whether you need real-time traffic information, a parking guidance system or truck parking, you will find everything you need.